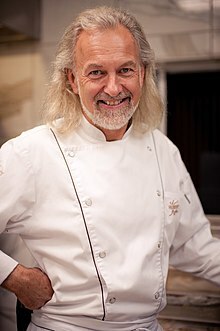 Hubert Keller is a noted French chef, who is known for his signature restaurants, Fleur de Lys in San Francisco and Las Vegas. Keller was born in Alsace, France, and graduated from the École Hoteliere in Strasbourg. Beginning as a pastry chef, he worked in various restaurants including Auberge de L'Ill, the cruise liner Mermoz, Domaine de Chateauneuf, and Moulin de Mougins in France, and La Cuisine du Soleil in São Paulo, Brazil. He trained under Paul Haeberlin, Paul Bocuse, and Roger Vergé before coming to San Francisco in 1982 to revitalize the now-defunct Sutter 500. In 1986 he became co-owner and executive chef of the original Fleur de Lys in San Francisco. He later opened a gourmet Burger Bar in Las Vegas, Nevada, which features a $60 "Rossini Burger" made of American Kobe beef, sautéed foie gras, and shaved truffles. Shortly thereafter he opened a second Fleur de Lys, at Mandalay Bay. Chef Keller also opened a French influenced steakhouse in Downtown St. Louis called SLEEK, which is regarded as the best steak house in St. Louis. He was the consulting chef at the Club XIX, at the Lodge in Pebble Beach in Pebble Beach, California. He is the author of The Cuisine of Hubert Keller and is the co-author of Dr. Dean Ornish's Eat More, Weigh Less. Keller was the first guest chef with Jean-Marc Fullsack to cook a dinner for a president (Clinton) in White House history and to train the White House chef in healthy cooking with the guidance of Jean-Marc Fullsack. In 1988 Hubert Keller was ranked as one of the "10 best new chefs in America" by Food & Wine magazine. In 1997 he won the James Beard Foundation/Perrier-Jouët award for America's Best Chef in California. Keller also received the James Beard Foundation's Who's Who of Food and Beverage in America lifetime achievement designation in 2003. Fleur de Lys has been ranked as one of the top 40 restaurants in the United States in 2004, 2005, and 2006 by Gayot restaurant guide, and was awarded one Michelin star in 2006. Fleur de Lys has also been ranked as one of the top 25 restaurants in the United States by Food & Wine magazine. Hubert Keller, John Harrisson (August 1996). The Cuisine of Herbert Keller. ISBN 0-89815-807-9. Hubert Keller, Penelope Wisner (April 2009). Burger Bar: Build Your Own Ultimate Burgers. ISBN 978-0-470-18767-8. Keller is also an avid DJ, frequently performing at food-related events. His friend, San-Francisco-based DJ "Frenchy le Freak", taught him the skills in exchange for cooking instruction. ^ "Chef Hubert Keller's Biography on StarChefs". Starchefs.com. Retrieved 27 April 2011. ^ "Fleur De Lys Chef Hubert Keller – Las Vegas". Usmenuguide.com. Retrieved 27 April 2011. ^ "White House gets out of the frying pan". washingtonpost.com. 9 March 1994. ^ "Best New Chefs – 2011 , Food & Wine". Foodandwine.com. Retrieved 27 April 2011. ^ "CuisineNet special". 1997. Archived from the original on 13 May 2008. Retrieved 10 September 2009. ^ "Welcome to the James Beard Foundation". Jamesbeard.org. 4 July 2010. Retrieved 27 April 2011. ^ "Welcome to the official website of Chef Hubert Keller". Fleurdelyssf.com. Archived from the original on 30 November 2001. Retrieved 27 April 2011. ^ Martin, Denise (11 June 2009). "'Top Chef Masters': Cooking in the shower? Ingenious yet gross". Los Angeles Times. ^ Carbone, Gina (10 June 2009). "'Top Chef Masters': Hubert Keller is The Man". Sea Coast Online. ^ "Hubert Keller: Master Chef/DJ". VegasInc.com. 11 June 2011. ^ Tate, Ryan (28 March 2007). "Hubert Keller doubles down in ... St Louis?". Covers. ^ Mennies, Leah (10 May 2011). "Put Your Hands Together For Chef-Techno DJ Hubert Keller, The Man Brings Down The House". The Feast. This page was last edited on 4 February 2019, at 19:43 (UTC).